Hunting the majestic red stag in New Zealand is the dream hunt of many people. Pursuing the Himalayan tahr in the Southern Alps adds a degree of difficulty to the hunt. In addition to these two beautiful creatures, New Zealand also offers Fallow deer, Arapawa rams, South Pacific wild goats, pigs, wallabies, and other deer species. New Zealand is a mecca of magnificent hunting at all levels. Being in the Southern Hemisphere, New Zealand’s peak hunting season is the exact opposite of the American big game season. March, April and May offer the most variety of hunting and the best weather. Packing for the hunt can be a bit confusing though. 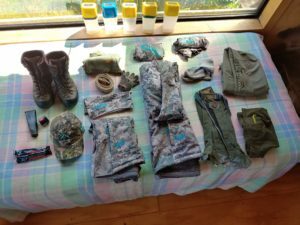 Here is how I pack for my hunting season in New Zealand. Be prepared for cooler mornings and warm to hot afternoons. By May, you could have light snow and many mornings will be frosty, so layering, at all time,s is important. Always, have a longer sleeve and a short sleeve base layer. I would also suggest at least one of these be wool. Also, for added warmth, especially needed toward the end of April and May, a beanie, neck gaiter or ear warmer over your hat will keep the chill out. Gloves are also a must, particularly when glassing on cold mornings. Lightweight, wool blend gloves are the best. They allow for finger movement and mobility both cut the cold and reduce the wind. These top layers can be worn in whatever combination works for the temperatures for the day. At the beginning of the season I will start the day an Aerowool merino cross long sleeve, GWG Performance Tee on top and the Artemis vest for added warmth, by mid-afternoon I am down to just the GWG Performance Tee, and by evening I am back into the full layers again. By the middle of May, the day will start with merino wool hoodie, topped with the GWG Stalker Long Sleeve, the GWG Artemis Vest, then either the GWG Artemis jacket of the GWG Kilima Puff, sometimes layering both for spotting. The GWG Kilima Puff Jacket is a great addition to any hunting wardrobe. The reversible feature makes it great both in the field and out site- seeing or exploring town. During the beginning of the season, early March, it can get quite warm, especially while hiking up mountains. Following in traditional Kiwi style, I can be seen wearing shorts for hunting on these days. Most prefer long pants. They need to be able to move and stretch while climbing mountains and lightweight and breathable no matter the time of year. Pockets for cameras, phone and knife are also an important consideration. Wearing camouflage in public is somewhat frowned upon in New Zealand. 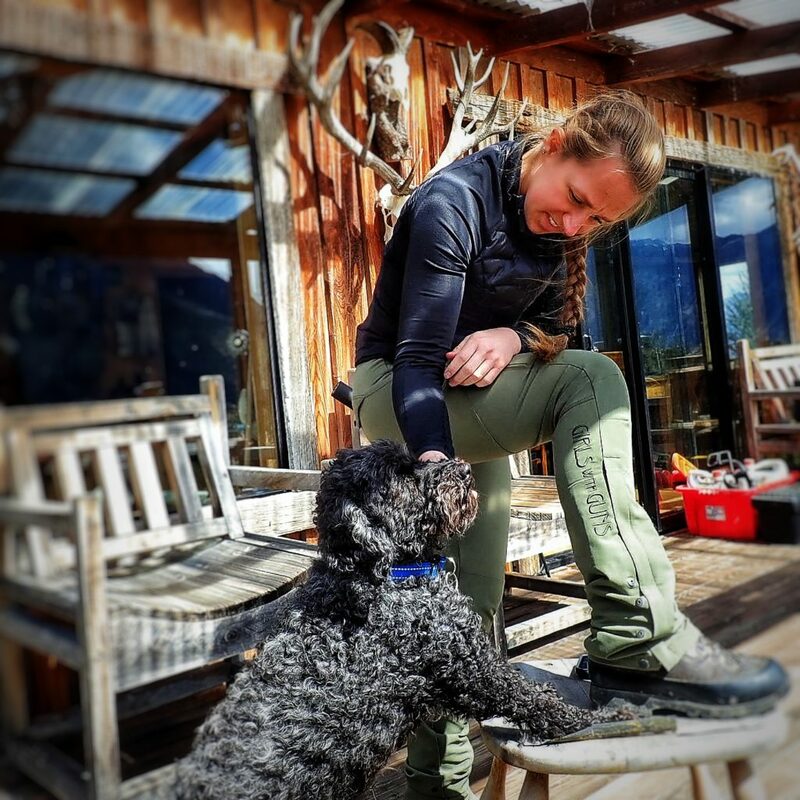 That is why I highly recommend the Lassen Hiking Pant. This is a great pant to hunt in and it can be worn in town without catching inquisitive stares. Rain gear might not be needed during your hunt, but it is better to be safe than sorry. Chances are, it will rain at least once during your hunt. Ask Jen and Norissa about their experience tahr hunting in the Southern Alps. It never stopped raining! Lightweight rain gear works good to stay dry or as a windbreak if it gets windy. I recommend the GWG Rain Jacket and Pants. I have worn them in Alaska, Canada and New Zealand and they still maintain their water repelling features. Just as in any other hunt, keeping your feet comfortable is one of the most important parts of your attire. A good, solid, mountain hiking boot with good tread is a must. Depending on the time of year and your preference, uninsulated up to 400 grams insulation works great. It is also important to bring boots that are waterproof. Pair this with good hiking socks, I recommend some type of wool or wool blend. Gaiters are also important. They keep all the terrible New Zealand prickly bushes and seedy plants out of your boots. Gaiters also offer a bit more water proofing and higher up the leg. Many times in the rain, I wear gaiters to keep my pants dry rather than rain pants. New Zealand’s mild climate can be quite deceptive. The sun rays in New Zealand are much stronger than the US and even Australia. You can be severely sun burned in less than 10 minutes on a bright day. Make sure you bring a hat and sunscreen! Girls with Guns make a variety of caps to shade your face and in camo. Bring your own sunscreen that you use at home. That way you don’t have to worry about an allergic reaction to a new product. Also, sunscreen is very expensive in New Zealand. I am not talking about jewelry and purses, but packs, gear, and supplements. Hunting with an outfitter you will not need more than a day pack, if you even need that. A small, comfortable pack to carry water, snacks, camera, extra ammo and a knife is all you need. I always bring a supply of Wilderness Athlete. Hydrate and Recover is great after a long day on the mountain, especially in hot weather. Energy and Focus offers a mid-afternoon boost on a long day hunting. Depending on where you are hunting determines your access to a shower. If you are doing any overnight camping or in a cabin with no facilities, Balleck Outdoors makes a great dry shampoo and “Gunk Off” body and face cleanser. New Zealand offers phenomenal hunting opportunities in some of the most scenic areas of the world. Layer up, shoot straight and don’t forget your camera. You will make memories to share for years to come. Good Luck and Happy Hunting! You can follow along on Lora’s adventure’s here.